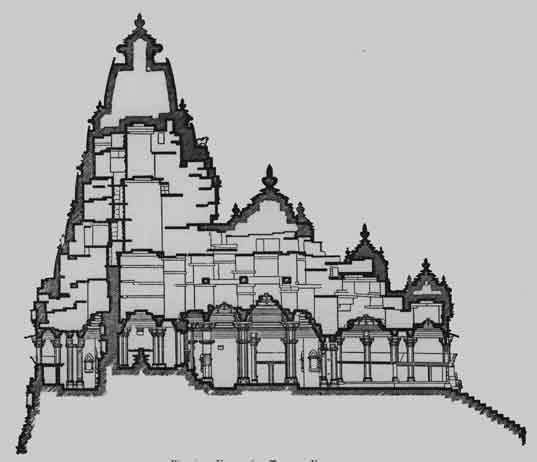 A Vedic Hindu temple’s architecture is a divine and yogic representation of a human being as shown in the figure . 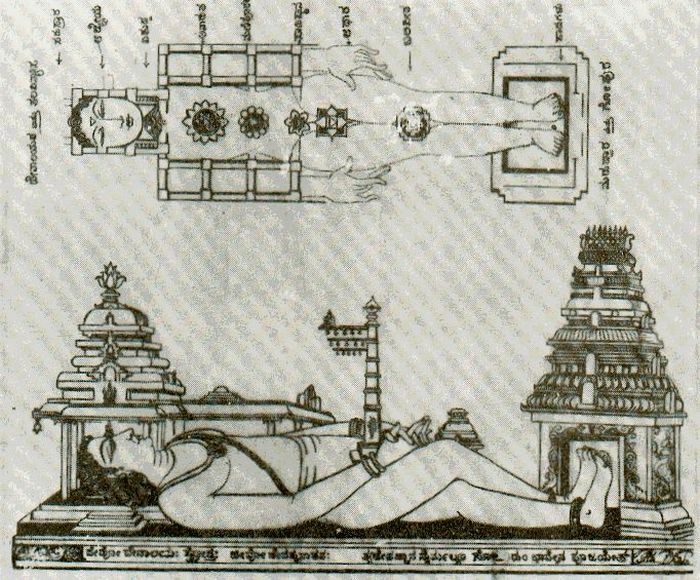 The feet represent the spire (rajagopuram). The hands represent the walkway (prakaaram) encompassing all around the temple. The main hall (mandapam) represents the abdomen. The entrance porch (antaraalam) represents the heart. The sanctum sanctorum (garbha griha) represents the head. The deity is consecrated with religious rites in the sanctum sanctorum. There is proportionality between the size of the deity in the sanctum sanctorum and the sizes of the temple construction details. Now, whenever we come across any Hindu temple we often see couple of patterns. One sees fractal-like spires (shikharas), and other parts of the architecture which are self-similar to the unity of the whole. When we look at the symmetry of the temple we come across questions like, how exactly was this built? What was the basic architectural layout? What was the mathematical concept that was used & what kind of geometry that they possessed to construct such a temple? What kind of mathematical concepts they had used? It is necessary to consider some basic aspects of the Hindu worldview, overarching and under girding worldview concepts, to see how they form the background of specific sacred buildings in India. Those who are unfamiliar with Hinduism may not expect a simultaneous complex of ideas expressed in a massive structure. One might expect a single motif in a sacred structure — a temple in the shape of a chariot, or a church shaped like a ship with an up-pointed prow – and such one-theme structures do exist. But there are also Gothic cathedrals with designs that include a forest of spires, a floor plan which is cross-shaped, a rose window above the main altar and many other forms–statues and symbolic art works– displaying a combination of themes. One encounters these simultaneous archetypal themes and meanings conveyed (and hidden) in the semi-abstract forms in many Hindu temples. There are rules of shape and proportion in the authoritative texts of Hindu tradition (shastras and agamas) which give birth to a variety of complex temple designs. The Brihat Samhita text (4th century CE) says the temple should reflect cosmic order. To understand the uses of recursive geometrical forms involving self-similarity on different scales (fractals) in the Hindu temple complex we will need to explore some of these deep images and their uses. Vaikhanasa Aagama Sastra is the base for architecture and rituals performed in most of the Vishnu (and his avatars) temples, especially in South India. The Agamas are a collection of Sanskrit, Tamil and Grantha scriptures chiefly constituting the methods of temple construction and creation of idols, worship means of deities, philosophical doctrines, meditative practices, attainment of sixfold desires and four kinds of yoga. The Agamic religions are also called Tantrism, although the term ‘tantra‘ is sometimes used specifically to refer to Shakta Agamas. The origin and chronology of Agamic religions remain contentious. The tantras are considered innumerable with various sects. Some popular agama-based religions are those of Shaiva, Vaishnava, Shakta, Ganapatya, Kaumara, Soura, Bhairava, and Yaksha-bhutadi-sadhana. The Shaiva Agamas revere the Ultimate Reality as Lord Shiva (Shaivism). The Vaishnava-Agamas adore the Ultimate Reality as Vishnu (Vaishnavism). The Shakta-Agamas (Tantras) venerate the Ultimate Reality as Shakti (Shaktism). Each set of texts expands on the central theological and philosophical teachings of that sect. There exist 28 Saiva Agamas, 77 Shakta Agamas and 215 Vaishnava Agamas, and their upa-agamas. In the Malay language the word Agama literally means ‘religion‘ and they are non-vedic in origin. Agama traditions have been the sources of Yoga and Self Realization concepts in the Indian subcontinent, including Kundalini Yoga and encompass traditions of asceticism. Tantrism includes within its fold Buddhist and Jaina tantras suggesting that Hindu, Jaina and Buddhist tantrism developed separately after arising from common sources of Tantric elements. The Agamic tradition, in general, has been dated to the pre-Mauryan period as references to the tradition are found in later vedic literature of Atharvaveda. The aagama tradition is often contrasted with the nigama tradition; the latter possibly a reference to the unchanging vedic tradition. The Hinduism of today is in many way a blending of aagama and nigama approaches. Agama (Sanskrit आगम) is derived from the verb root गम (gam) meaning “to go” and the preposition आ (aa) meaning “toward” and refers to scriptures “that which has come down“. It also means “a traditional doctrine, or system which commands faith“. Agamas deal with the philosophy and spiritual knowledge behind the worship of the deity, the yoga and mental discipline required for this worship, and the specifics of worship offered to the deity. The ritualistic pattern of worship in the Agamic religions differ from the Vedic form. While the Vedic form of yajna require no idols and shrines, the Agamic religions are based on idols with puja as means of worship. The Agamic deities are pinned to a specific spot and assume the nature of a territorial deity. The Aagamas state three essential requirements for a place of pilgrimage – Sthala, Tīrtha and Murthy. Sthala refers to the temple, Tīrtha, to the temple tank and Murthy to the deity(ies) worshipped. A temple may also be associated with a tree, called the Sthala Vriksham. For instance, the Kadamba tree at the Madurai Meenakshi Sundareswarar temple is the Sthala Vriksham. A lone banyan tree that adorns the spacious courtyard of the Ratnasabha at Tiruvalankadu is the Sthala Vriksham. The entire area is believed to have been a forest of banyan trees once. Elaborate rules are laid out in the Aagamas for Silpa (the art of sculpture) describing the quality requirements of the places where temples are to be built, the kind of images to be installed, the materials from which they are to be made, their dimensions, proportions, air circulation, lighting in the temple complex etc. The Manasara and Silpasara are some of the works dealing with these rules. The rituals followed in worship services each day at the temple also follow rules laid out in the Aagamas. Most commonly used Aagamas are : Siva, Vaishnava, Sakta, Pancharatra (Centered around one diety with others surrounding), Gaanapatya (Ganapati), Soura (Sun).